Ex G.E.R. C72/B.R. J68 0-6-0t. 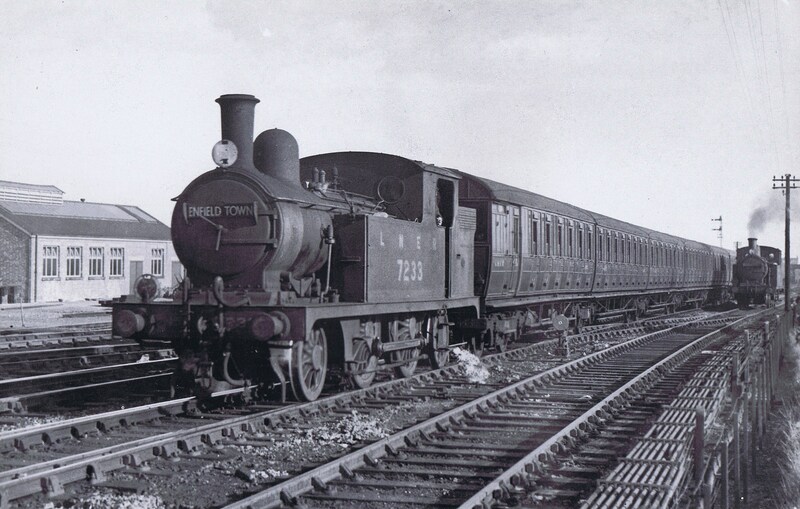 Midland & South Western Junction Railway. Dubs 2-4-0 No.10. Norwegian Railways 3′-6″ gauge Beyer Peacock 0-4-4t. Ex G.E.R. C32/ L.N.E.R. F3 2-4-2 t.
LNWR 3 cyl. Compound “A” class 0-8-0 Goods Engine. The title to this section does sound like a contradiction of terms but let me explain. Obviously passenger coaching stock is designed to carry people, where as non-passenger stock is for anything but people. The vehicles are built to the same standards as coaches as they are designed to run coupled to passenger trains, but not always. Dedicated parcels and milk trains ran at passenger train timings and sometimes as expresses. I will deal with NPCS vehicles individually later, but firstly we will look at passenger stock. Passenger stock was varied but not quite as much as the above list of NPCS vehicles. All passenger trains would consist of at least one brake coach in which the guard would travel as he had the responsibility of not only the passengers and their safety but of the train it’s self, along with the locomotive crew who controlled the movement of the train, but it was the guard who had ultimate control as he would signal or instruct the driver as to when to depart from stations etc. Gresley Quin Art sets ……. First/Third, Third, Third,Third, BK Third. 3-car set……………. BK Third/Third/BK Third. Under ownership of the LNER the branch line (ex GER) to “Bow Creek” would have been classed as an inner suburban line I suppose and the stock used would be non-corridor compartment coaches for the normal passenger WTT (working time table). On the busy commuter suburban lines running out of Liverpool St. at this time (1946) the LNER would be using two sets of quin-art’s but the Bow Creek branch is predominantly a freight line, the passenger service being mainly to serve the workers in the docks and surrounding industries, so although it would be busy in the early mornings and late afternoon/early evenings it would not be such an intensive service as the “Jazz” trains in and out of Liverpool St.. I have assumed a regular service, similar to that of the North Woolwich branch, running via Stratford to Palace Gates as the majority of workers in the East End would be living in and around the eastern and north eastern suburbs of London. I aim to include in the time table a couple of trains that will run into or via Fenchurch St. in the evenings for those passengers that visit the City perhaps at week ends only, I need to study other WTT’s of branch lines in the area. If you have any info on this subject I will be only to pleased to hear your comments. The passenger coaching stock used for this line would be Gresley quin-art sets on the regular peak time services, early morning/late afternoon, while the mid-day services may typically use a three car set, the make up being BT, C, BT which may also be used on the “City service” at week-ends. F4 2-4-2 t and quin-art stock, this would be a typical passenger service on “Bow Creek”.